However, today’s activists and other students are growing up in a wonderfully diverse, polycultural global society that increasingly acknowledges and embraces our individual “multidimensionality” as complex beings with many identities. News media coverage and even our own campus dialogues have largely essentialized this incident into the right to free speech versus the need for . . . Wait! Stop the tape! “Essentialized” this incident? Essential is either an adjective or a noun; it is not a transitive verb. You know when you see a fancy person like Nair turn “essential” into a transitive verb that you are in the presence of no ordinary mediocrity. No wonder Nair is an administrator. Although the phrase “Trump 2016” in and of itself may seem innocuous to many, in the context of the important work happening on our campus to ensure that every student experiences a sense of belonging, the recent chalkings spurred students to enunciate their claim to an institution in which they can feel like invited guests. Second, some of the chalkings on Emory’s campus were a violation of university policies, certainly not because of the content, but because the chalkings were done in unacceptable locations and without reserving the space. Our guidelines concerning public messaging are crucial to maintaining open expression. By coincidence, tonight I’m up at Berkeley, staying a short walk away from Sather Gate, the scene of the beginning of the Free Speech Movement at Berkeley in 1964. That famous eruption began because of . . . university restrictions on the places where students could put up card tables and engage in political messaging. Now students and weak-minded administrators like Nair want to crack down on political speech, but only when it is politically unacceptable speech. It would be one thing if “chalking” were prohibited campus wide, but this is clearly just a bureaucratic hedge to clamp down on speech the left doesn’t like. Would Nair make this same statement if campus Republicans objected to someone chalking “Sanders 2016”? Don’t make me laugh. The intensity, timing and anonymity of the “Trump 2016” chalking incident produced a tipping point. In the context of a college campus, we thrive on open and civil dialogue, inviting even the most controversial perspectives and remarks. Pretty clear that the last clause here—“even the most controversial perspectives and remarks”—is a lie. I could go on, but the disgrace that is Dean Nair is pretty evident at this point. Besides, if you have a moment, check out the comment thread at the Inside Higher Ed link. They are uniformly negative. Our work here is done. The only question is: When is Emory president James Wagner going to put an end to this embarrassment? According to Emory’s 2014 IRS Form 990, Nair’s base salary that year was $302,405, with additional compensation listed at $43,008. I think I can see an easy way for Emory to cut its budget. First of all, a whiteboard on the student’s door!!?? There’s a microaggression right there. 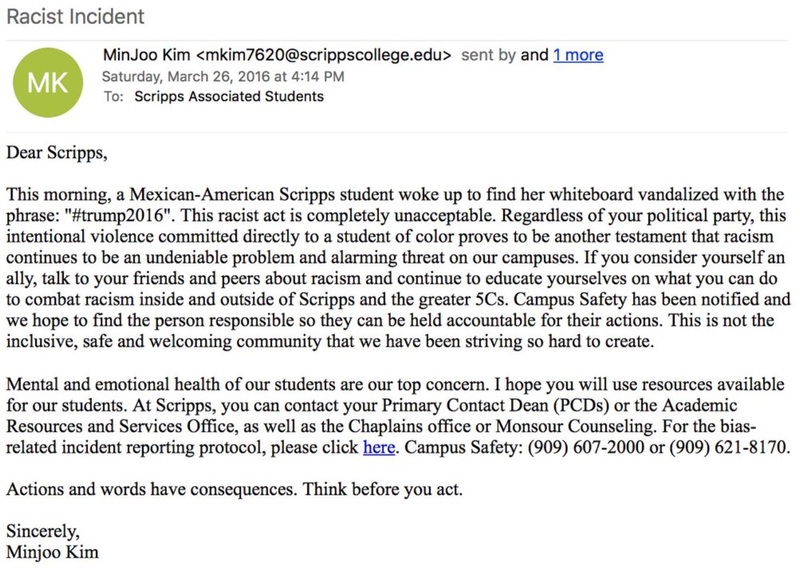 Putting whiteboards on students’ doors might even rise to the level of a macroaggression. “Also, dude, ‘hispanic’ is the preferred nomenclature for our southern friends. . .” Because the Chinaman is not the issue here.